A new piece of ransomware is spreading rapidly across China that has already infected more than 100,000 computers in the last four days as a result of a supply-chain attack... and the number of infected users is continuously increasing every hour. What's Interesting? Unlike almost every ransomware malware, the new virus doesn't demand ransom payments in Bitcoin. Instead, the attacker is asking victims to pay 110 yuan (nearly USD 16) in ransom through WeChat Pay—the payment feature offered by China's most popular messaging app. It also includes an additional ability to steal users' account passwords for Alipay, NetEase 163 email service, Baidu Cloud Disk, Jingdong (JD.com), Taobao, Tmall , AliWangWang, and QQ websites. A Supply Chain Attack — According to Chinese cybersecurity and anti-virus firm Velvet Security, attackers added malicious code into the "EasyLanguage" programming software used by a large number of application developers. Using Digital Signatures — To defend against Antivirus programs, the malware uses a program with valid signature to execute the virus code and also avoids encrypting data in some specific directories, like "Tencent Games, League of Legends, tmp, rtl, and program." Once encrypted, the ransomware pops-up a note, asking users to pay 110 yuan to attackers' WeChat account within 3 days to receive the decryption key. Researchers also managed to crack and access attackers' command-and-control and MySQL database servers, and found thousands of stolen credentials stored on them. Who Is Behind This Ransomware Attack? 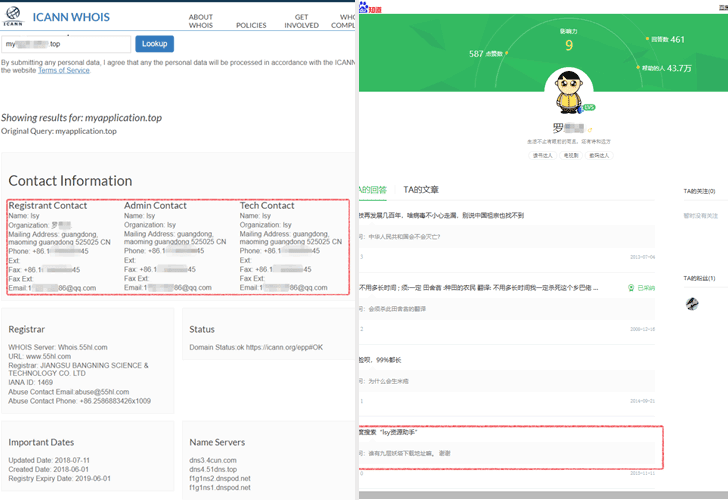 — Using publicly available information, researchers have found a suspect, named “Luo,” who is a software programmer by profession and developed applications like "lsy resource assistant" and "LSY classic alarm v1.1"
Lua's QQ account number, mobile number, Alipay ID and email IDs match with the information researchers collected by following the attacker’s WeChat account. As explained in the article above, the hacker (whose name and identity was revealed by security researchers as Luo Moumou) didn't do much to clear his tracks, making it easier for authorities to track him down within 24 hours. "After the trial, the suspect Luo Moumou confessed to the fact that he was making new ransomware to destroy the computer information system and using WeChat to pay for blackmail," Chinese media reported. "According to his confession, in June 2018, Luo Moumou independently developed the virus 'cheat, which was used to steal the account password of others Alipay, and then steal funds through transfer."